Hi! 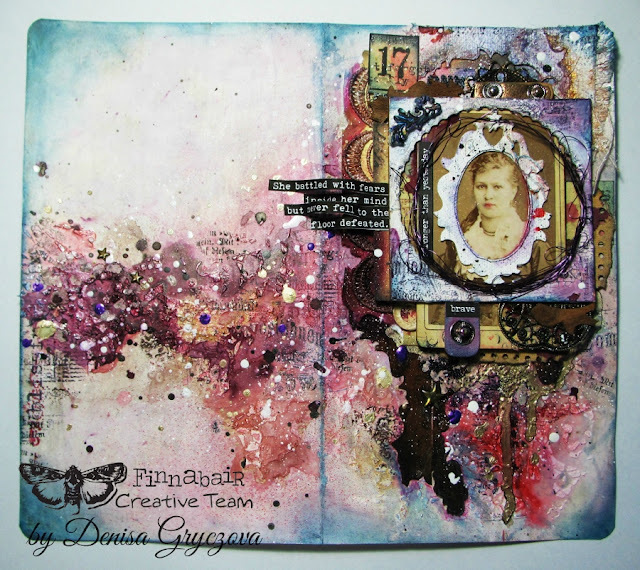 It´s Denisa here with an art journal spread. Had to do something a bit vintage, powerful and wild. No sparkles and stars this time. We´re starting a brand new year and there´s no doubt we´ll have to face new problems, difficulties and struggles. Therefore my positive motto for you today is to be strong, be daring and never give up without a fight! Never fall on the floor defeated! And this is the theme of my AJ. 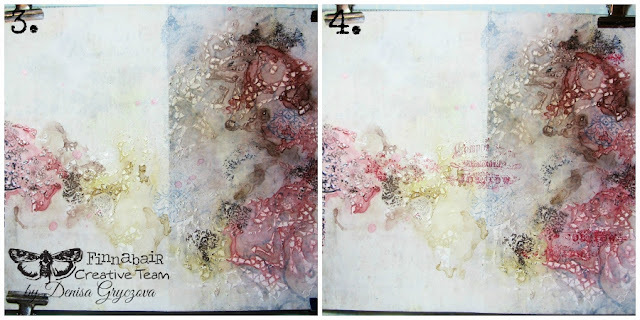 I started with a double page of thick scrapbooking paper. I rounded the edges and covered the whole paper with a thin layer of White Gesso using my old credit card. Let it dry. 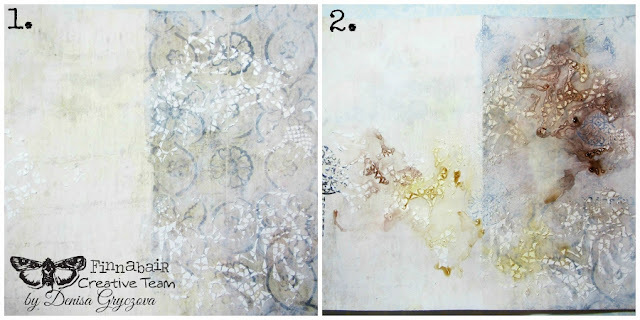 Next I did some stenciling using my fave stencil and Light Paste. When dry, I added a bit of colour using various sprays. No holding back. Wild and dominant colours. I let it dry and applied another thin layer of White Gesso here and there, this time applied with my fingers and a wet baby wipe to achieve the smoky look. When dry, I did some random stamping using black and red Archival Ink. 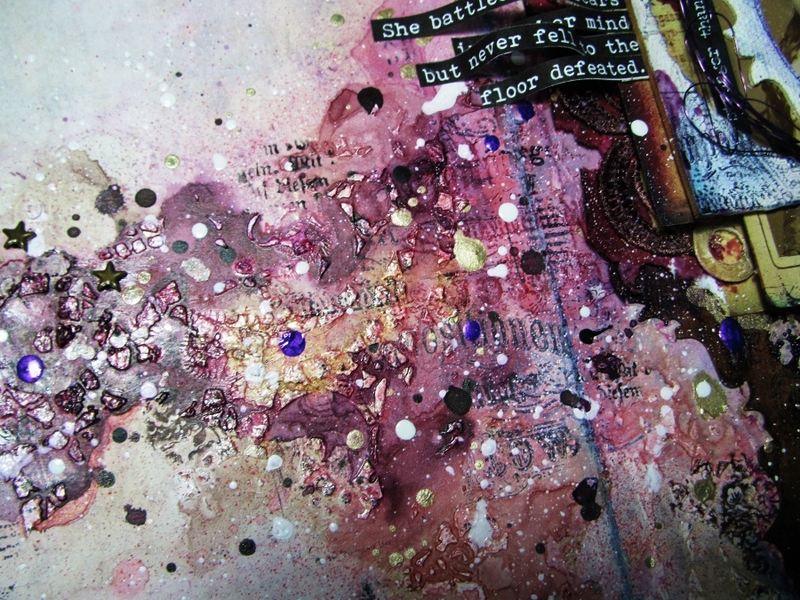 I added some more colour, stamping and started to build up the cluster. As the focal point I chose a vintage lady whose pic I framed three times using a chippie, a wire and a canvas ornament. 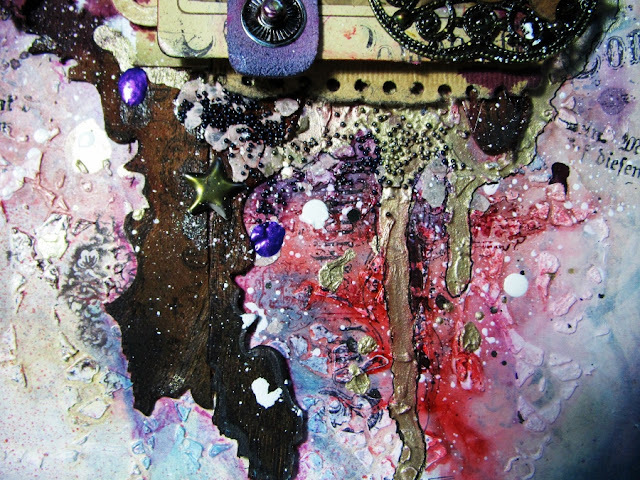 I also used some lace, Mechanicals Flowers, Mechanicals Stars, paper bits and leather bracelet leftovers. 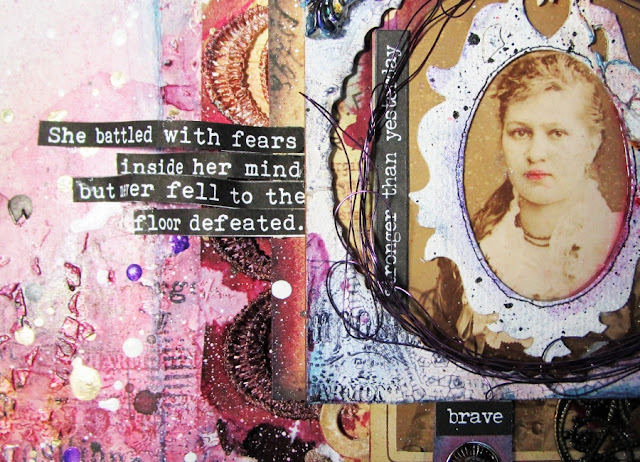 I printed out the sentiment saying: She battled with fears inside her mind but never fell on the floor defeated. I adhered it to the paper using Soft Matte Gel. Next I inked the edges using dark blue Archival Ink. The last thing I did were some Ecoline splashes and drips. To make the texture of my page even more intereting, I sprinkled some Berry Micro Beads. Hoping no problems come in your way this year and if so, just remember my motto. Wishing you a perfect year all around - full of inspiration, peace and love! Your journal pages are gorgeous - wonderful bold colors, awesome photo and sentiment!